Debt relief experts in Tucson, Arizona can assist you when facing financial hardships in Tucson, Pima County, Arizona. You may have faced a situation where you need to take on a debt. (Either expected or unexpected) Sometimes this is an urgent need or an unexpected obligation that forces you to let your other bills and financial commitments go unpaid. It happens that unwanted and unexpected events come up that destroy you financially, no matter how carefully you have planned your finances. Often times taking on this additional financial burden takes its toll and you soon realize that getting out of the accumulated debt is not easy, and that burden of debt weighs heavily. In certain cases of larger debt, it can be crushing. It is completely reasonable to feel the pressure and anxiety when your debt becomes more than you can handle. Despite the reasons for the debt or your attempts to rectify the situation, when the debt gets too overwhelming, one option that you have is to explore filing Chapter 13 or chapter 7 bankruptcy protection in Arizona. Filing bankruptcy protection may help you recover your finances and give you a fresh start. You do not have to do this alone! And you are not alone, as countless people (1.5 million in the US each year) are facing a similar situation. There are experienced bankruptcy attorneys and debt relief experts that can help you to answer your questions and who can give you the best advice as to get you out of debt and back to your life. Because individuals experience setbacks in life such as accidents, a death in the family, job loss, illness, divorce, or business failure, debt happens. With talk in the news about “financial bailout,” maybe you have asked yourself upon finding yourself in unexpected financial distress, “what about MY financial bailout?” The creditors do no stop calling, bills are going unpaid, and your debt is getting way over your head. There are options for you, do you know and understand your options when you’re at the point where you’re reading a blog regarding bankruptcy? 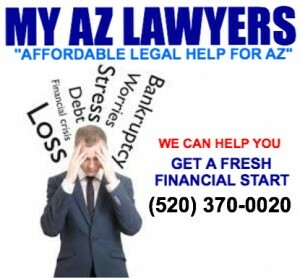 Consult an Arizona bankruptcy law office to help you choose the best path you need to take on the road to your financial recovery. There are lots of reasons to feel financial pressure and stress due to troubled economic times. If there is not enough money to pay the bills, and it seems there is nowhere to turn, no one to help, and no escape from the daily stresses of the situation, then it is time to seek some debt relief. The lawyers are experienced to find solutions to your money problems. Divorce, debt relief, and bankruptcy attorneys can explain your options and how your decisions from here on out will affect your life in the future. In order to stop the creditors, stop the phone calls, and stop the pressure you have to deal with on a daily basis. Making a phone call to discuss your particular circumstances could just quite possibly be your financial bailout. Do not wait to consult an expert, as if you do not see a resolution to the problem in the near future, the debt and stress and aggravation will compound. A Tucson debt relief expert can help guide you through dealing with your creditors. In many cases, the longer you wait, the fewer choices for debt relief you may have. You are ultimately in charge of the decisions that you will make to get your finances back on track. Now that you are ready to make a resolve to overcome your financial issues, get the financial advice, the fresh start, and the financial bailout that you have been looking for. There are many Arizona debt relief agents that are waiting to assist you.